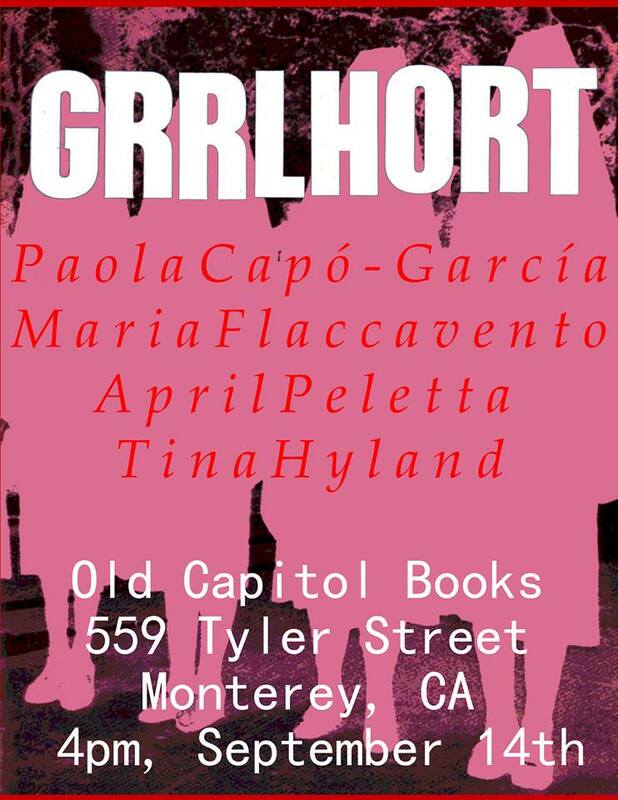 September 14th, 4pm – Old Capitol Books is pleased to be hosting GRRLHORT, and afternoon of poetry with students in the UC San Diego MFA Program for Writing. Tina Hyland‘s work has appeared or is upcoming in BESTIARY: the best of the inaugural demi-decade of A Cappella Zoo, Barge Press, >kill author, and numerous other print and online journals. Her interests include feminism, body politics, animal rights, and how those topics can intersect through slipstream, fabulism, and poetic genres. Her current project, a grimoire of internet spells, is a collision space for exploring arrangements of tradition and modernity, passive and enacted texts, and using the material to access immaterial spaces. She has traveled to over 20 countries and was living in South Korea before starting the MFA program program at the University of California in San Diego. Paola Capó-García is a poet and translator from San Juan, Puerto Rico. She received her B.S. in Magazine Journalism at Syracuse University and her M.A. in Poetry from UC Davis. She is currently working on translating the work of Puerto Rican Queer poet Manuel Ramos Otero. Her reporting has appeared in BOMB, Variety, and ELLE, and her poetry in Salt Hill,Conium Review, El Vestíbulo, and Catena. Paola continues her work as a journalist by co-editing Remezcla, an online music source focusing on independent music from Latin America. She also worked in reality TV for a second but really doesn’t want to talk about it. April Peletta is a poet and digital media artist form Northern California. She earned B.A. in English from Mills College and is working on a collection of ecolyric poetry that explores collisions between public space, industry, and personal ecology. When not in class she may be found traveling around California exploring the way water moves. Her work has been published in the American River Review, Late Peaches, The Walrus, Tule Review, Soul of the Narrator, and Susurrus. She has presented her critical work at Weber State University Utah and the University of Ottawa, Canada. Maria Flaccavento is a poet from southwest Virginia and northeast Tennessee. She studied anthropology and Italian literature at Temple University in Philadelphia. Her poems can be found in the Apiary and Bedfellows.